Thu, Oct 18, 2018, 08:20 pm SL Time, ColomboPage News Desk, Sri Lanka. 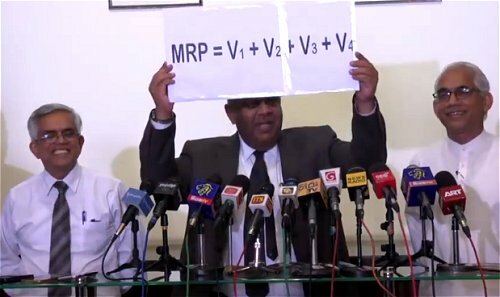 Oct 18, Colombo: Sri Lanka's Finance Minister Mangala Samaraweera today reveled the recently introduced fuel price formula calculation method to media following repeated calls to know the formula. 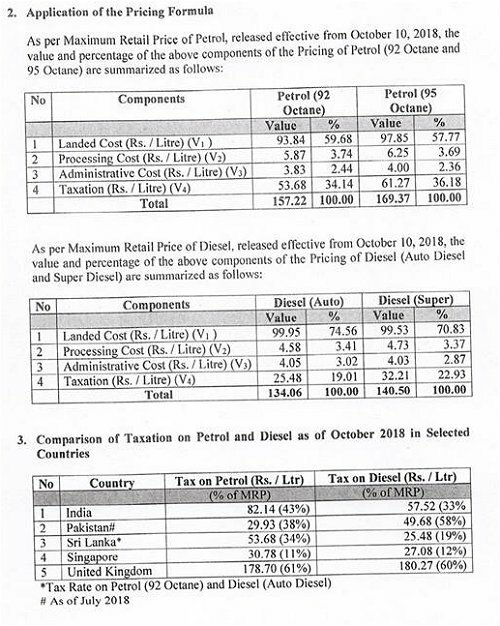 At a press conference held in the Ministry of Finance today, the Minister explained that Maximum Retail Price of fuel is established as a sum of all the costs associated with the distribution of fuel. The setup of Maximum Retail Price formula is shown below. The Cabinet of Ministers has granted approval for implementation of a cost reflective formula based pricing system of Auto Fuels effective from May 1 I. 2018. V1- Landed Cost (Rs. / Litre): Which includes Singapore Platts Price per Barrel. Weighted Average Premium per Barrel. Loss due to the Evaporation and Exchange Rate (USS)/I LKR are applied. V3 - Administrative Cost (Rs./ Litre) Which includes Administrative Expenses including Personnel Cost. Depreciation, and other cost elements, if any. V4 - Taxation (Rs. / Litre) Which includes Customs Import Duty. Excise Duty. Ports and Airports Development Levy and Nation Building Tax.